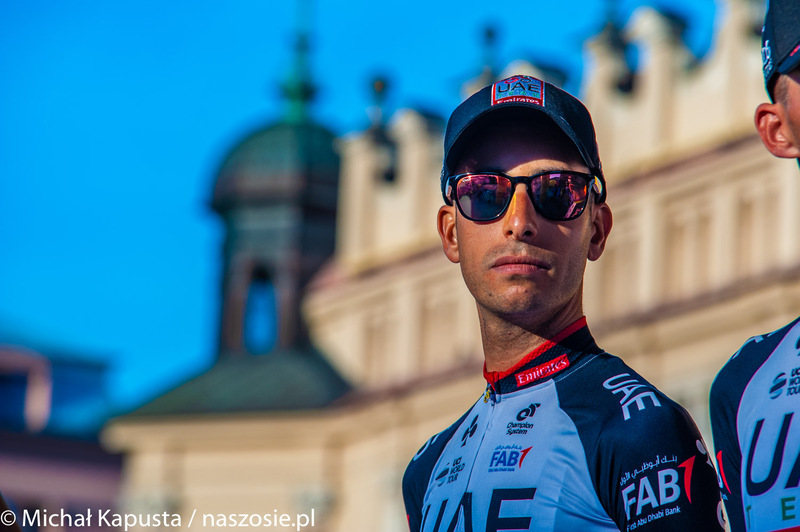 After a solid performance in the Tour de Wallonie, Fabio Aru (UAE Team Emirates) is racing in the Tour of Poland. He has no doubts this is a very important start for him. Many cycling experts consider you as a big hope for the Italian cycling, so do you feel a pressure? No, I don`t. I have no problem with that. Instead, I`m happy, because my childhood dream came true. As a young boy I was dreaming about racing at this level. Of course, I`m aware of the media attention and pressure, but it makes me more motivated rather than angry or something like that. Fans and journalists expect victories from me in every race I start but it`s impossible. That`s cycling. Anyway, I`d like to say I have a lot of respect to my fans and journalists. Do you have cyclist who you look-up to? I can say that Alberto Contador was my inspiration. Now the rider who inspires me the most is Alejandro Valverde. He`s 38 and he is still able to win and beat younger cyclists. I`d like to follow his steps and, at 38 years of age racing as him. You`re climber who likes intervals. Do you think the riders like you are able to oppose teams like Sky? I don`t want to make any comments about other teams` tactic. But, yes, I prefer dynamic races with many attacks, one after another. I don`t like when steady, hard work done by one team makes selection from the back of the peleton. What is your definition of cycling? From my young years I was very passionate about cycling. And my passion for cycling became my way of life. I`m very happy it gives me money as well. I hope I will be able to ride my bike for at least next 10 years. At the same time you have to realise there`s something more in your life than cycling – for example family. Relationships with my relatives are very important to me so every day I`m looking for a balance between cycling and spending time with my love ones. Is it true that gluten-free diet has a positive influence on your body condition? Yes, since I have changed my diet I feel better, lighter, and it hasn`t changed only my physical shape, but also improved my mental strength. What are your objectives in the Tour of Poland? I`m going to fight for a good result. It`s not only a part of my preparations to the Vuelta. I was fifth in the overall standing, so it would be nice to improve this result. Good performance in the Tour of Poland will give me confidence that I did a good job during my training period over the last few weeks. World Championships in Innsbruck will be the climbers` chance to wear the rainbow jersey. What is your approach to this race? World Championships in Innsbruck will be very important to me. It is one of the most important race of the season. I know the route because I did a reconnaissance. Italy, as a national team, has a strong rooster and it will be one of few occasions where we can fight for medals. Vincenzo Nibali is on right path to recovery after his crash in Tour de France. We believe he will build his form during the Vuelta. Now, it`s too early to say who will be our leader in Austria. I hope that Nibali and me will fight together for the coveted rainbow jersey. This interview was held in Czeladź, before the start of the third stage of the Tour of Poland. By Ela Kowalska, Onet and Marek Bala from Naszosie.pl. Następny artykułTour de Pologne 2018: Michał Kwiatkowski zwycięża w Szczyrku!